With the marina and yachts as a backdrop, there’s no better place to hold a luau than sun-soaked Sentosa Cove! 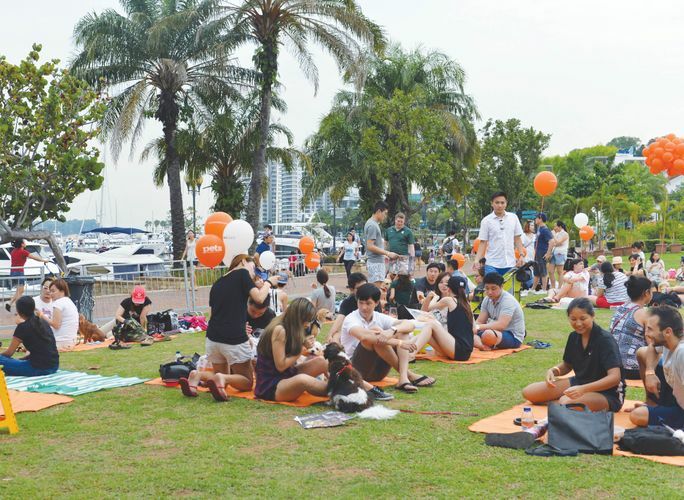 Over 500 proud dog owners will gather at Sentosa Cove’s green field with furry ones while indulging in a tasty picnic meal and interacting with other pet lovers. The afternoon event will include a bustling weekend market of craft and pet accessory stalls, fun stage games with the pooches and more. These beautiful memories can be captured at the Fourstops photo booth, free of charge to all participants. Pets Picnic Party 2017 will also partner with animal welfare group Causes for Animals (CAS) to hold an adoption drive at the picnic, so pet owners and their doggies can mix and mingle with the shelter pups to see if any might make a paw-fect new fur-mily member. One of the highlights of Pets Picnic Party 2017 is the attractive lucky draw, where attendees stand to win a 2D1N stay at the luxurious W Singapore Sentosa Cove worth $988, and dining vouchers for 2 pax at The Kitchen Table worth $160. Need more reason to be there? Adorable pooches togged in hula skirts, sundresses, and Hawaiian shirts. The best-dressed dog stands to win an attractive prize as well! Picnic packs include entry passes for 2 humans and 1 dog, a picnic mat, yummy Thai food, snacks & drinks, and more paw-some goodies! Charges for additional pax/dog apply, and each mat can fit up to 4 pax. To register or find our more information, visit https://www.petsmagazine.com.sg/petspicnicparty.